24 hours of UTC time zones in a fun online geography learning game. 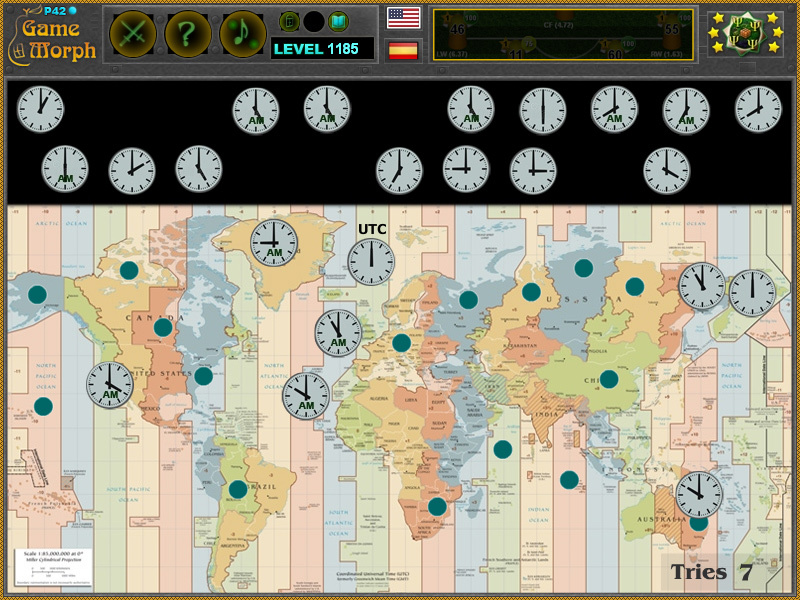 "Time Zones Puzzle" is a free online knowledge level game to sort the clocks in the correct time zone on the world map. It include 22 clocks to play with. Free online game to explore, learn or test the knowledge of UTC time zones of Earth. Geography puzzle game, suitable for online lessons and interactive classes. Minute to win it game. Background picture by Wikipedia. Game code by Ogo Bob. How to play Time Zones Puzzle. There are 22 movable clocks with different hour on the top of the game screen. Drag and drop them at the approximate time zone on the world map. They are 22 of 24 clocks because one clock is the pivot clock at the UTC 0, and UTC+12 and UTC-12 clocks overlap. Sort all 22 time clocks to win the game. Know and memorize at least 3 time zones and get +1 Knowledge Level. Because Earth is spinning, the time is different in different countries, except some countries, like USA and Russia, where they have many time zones. There are also different methods to set ana measure time zones. Because Planeta 42 is based on Wikipedia, we also encourage the UTC time zone, which is very simple and least confusing. Except those UTC+13 and UTC+14, which for the game are merged with UTC+12. So here is how it works: UTC 0 is again the Greenwich and is the base(pivot) point. Everything to the right, including Africa, Europe, Asia and Australia is +1, +2 and so on. Then if it is 12:00 in UK, it is 13:00 in Germany, 14:00 in Moscow and so on. Everything to the left of Greenwich, including ocean islands, Greenland and America is -1, -2 and so on, which means they are early. This is because Earth is spinning to the left (accepting that north pole is at the top). Which are the world time zones? What is the time ina USA if it is noon in Europe?